Elegantly simple, this yoghurt swirl soap recipe creates a tone on tone swirled effect in your soap using a water reduction technique, white mica and of course, yoghurt. I first came across the water reduction technique as a design tool when reading Auntie Clara's Blog, particularly her entry about her Ghost Swirl Soap. 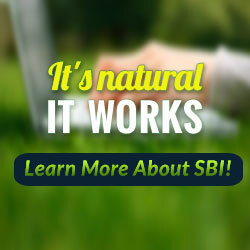 Visit her blog, you'll be glad you did. Clara Lindberg is quite brilliant with her soapy creations and seems to experiment quite a bit to push the envelope and see what wonderful things she can make soap do. In the recipe below, I decided to use yoghurt as my extra water amount and mica as my colour for the reduced water portion of the soap base. 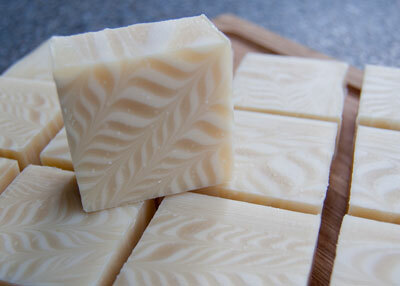 This soap has been left unscented so the fragrance of the cocoa butter used in the recipe can take centre stage. And it does! Be sure to purchase cocoa butter that has not been deodorized if you want the scent to come through. 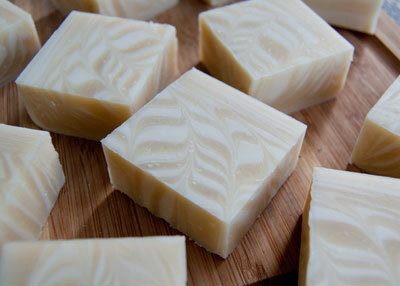 This recipe was made using the Cold Process method of soap making. I did not use the Room Temperature method as I was concerned that by reducing my water amount and using 50% hard oils, my hard oils might not melt completely. Begin the process by preparing your lye solution and placing it aside to cool. Place your soap mould into a preheated oven (170 degrees Fahrenheit) and turn the oven off. Prepare your yoghurt by bringing it to room temperature and mixing your white mica and olive oil together until no lumps remain. Put both aside. Weigh out your hard oils and melt them. Add in the liquid oils and mix. Once the lye solution and the oils have cooled to about 100 degrees Fahrenheit, gently pour the lye solution into the oils. Blend the soap batter until a very light trace has been reached. The soap batter will coat the back of the stick blender nicely but will not yet leave trails. Divide the soap batter in half. To one half of the soap batter, mix in the yoghurt. To the other half, mix in the white mica. Bring both mixtures to a light trace. You will now see very light trails in the soap. Start pouring the soap into the mould from one corner. For best results, allow the soap batter to pour down the edge of the soap mould walls. This seems to create more defined lines and helps to stop the colours from blending together. Alternate the colours until the soap batter has been used up. Using a wooden skewer, start in the corner you poured from and drag the skewer through the soap in a fan-like pattern. Pretend you are tracing fanned-out Peacock feathers on the soap. Out from the corner, back down to the corner. Keep repeating this until you've swirled the full surface. Spray the soap surface with 99% rubbing alcohol to help reduce soda ash...I keep forgetting to do this! Wrap up the soap and allow it to go through the gel phase. I placed mine on a heating pad set to medium for 30 minutes and then turned the pad off. Check the soap periodically by placing your hand under the blankets to see if it is really warm or not. Once the soap has fully gelled you can take the insulation off but do keep the lid on the soap to avoid exposure to air. Once the soap has cooled completely, it can be cut. Cure the soap for 4 to 6 weeks.